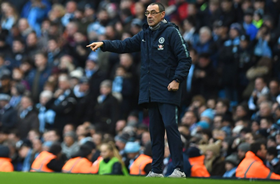 Chelsea's Nigerian fans have voiced their displeasure with manager Maurizio Sarri in the wake of the humiliating 6-0 loss to Manchester City in the Premier League on Sunday evening. The Citizens tore The Blues apart with ease inside the opening 25 minutes with Sergio Aguero netting twice while Raheem Sterling and Ilkay Gundogan scored their other goals, before the Argentina international completed his hat-trick in the second half and Sterling wrapped up the scoring in the 80th minute. Sarri's future will be the subject of speculation in the coming days after Chelsea suffered their heaviest defeat in all competitions since losing 7-0 to Nottingham Forest in 1991. @teemahagbalaya : ''Sarri 😂😂😂😂😂 I’m sure they’ll sack him today''. @oladot__ : ''Losing Hazard, forced to let odoi go, Sarri sack''. @ekwunife_dan : ''Voting President Buhari as Nigerian President is NOT the worst decision I have ever taken, Clamouring for Sarri appointment has been the WORST decision ever! If Chelsea don't sack that smoker tomorrow morning, I'll denounce being a fan of Chelsea. #MCICHE #Atikuinkano #Chelsea''. @peter_Ipuole : ''My head is screaming for Sarri sack''. @AAAlatishe : ''4-0 in 30 mins. Sarri is a fraud. Sack him. #SarriOut''. @Gbengapraiz : ''Abramhamovic please sack sarri before he destroys that team please #SarriOut''. @Hammedishau : ''Please sack sarri after this match''. @Oluwamayowafun4 : ''Pls who's typing sarri's sack letter😂😂😂''. @AlowakennouK : ''So this is the sarri that is better than conte abi .. Just help me remind him that his sack letter is ready .... sorriball jakujaku 😐''. @reggieakingbade : ''Sack Sarri if we don’t get top 4. What a joke''. @Big_fish_45 : ''What a disgrace 6-0 the worst I have ever seen in my entire life omg!!! Chelsea should sack sarri he is too stubborn with Jorginho playing that central role 😡😡''. @psalmuel__ : ''Hoping Sarri's sack letter is ready by Monday. Let him take back Jorginho. Somebody call Guus Hiddink or Di Matteo to save this sinking ship @ChelseaFC'.